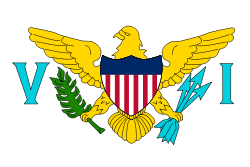 The U.S. Virgin Islands is one of five inhabited insular areas of the United States, along with American Samoa, Guam, Northern Mariana Islands and Puerto Rico. The territory comprises St. Croix, St. John, St. Thomas and Water Island. The main international airport of the US Virgin Islands is St. Thomas Cyril E. King Airport. Photo’s of the Virgin Islands (US) coming up soon, I hope.